This is my last post as a DT member at the World Wide Open challenge. I'm so sorry to be leaving but once the hustle and rush of holiday visits and travels are over, I'm going to find my lifestyle making a radical change and that means much less time for my usual creative pursuits. Not that I won't still be crafting and making cards but I need to be able to do it without deadlines or commitments. I'm staying on a couple of teams but I've resigned from most of them and World Wide is one. This month, we have our usual "Anything Goes" theme and I've used a delightful little elf from Julia Spiri to celebrate the Christmas season. The image is actually named "Little Gnome" but with the use of traditional Christmas red and green, it made a perfect elf! And, right now, it's also on sale at 50% off. Click on that link and go get it! I colored mostly with water colors but used ProMarkers on the hair, face, and eyes. I cut the image with a Spellbinders' die and inked it all around the edge. The background was done with scraps of papers from my Christmas stash, which I distressed along the edges. The green snowflakes are embossed stickers and the white one was punched and glittered. The bow was tied and I added a button to the center of the knot. Cute! Love the bit of Christmas-y ribbon. Thanks for playing with The House That Stamps Built. Oh what a cutie that Christmas Elf is!! I love her and your adorable card! Gnome or elf she looks like butter wouldn't melt in her mouth. So cute and i like the colours you have chosen. Thankyou for coming and spinning the fairy wheel with me this week. Hugs Mrs A. 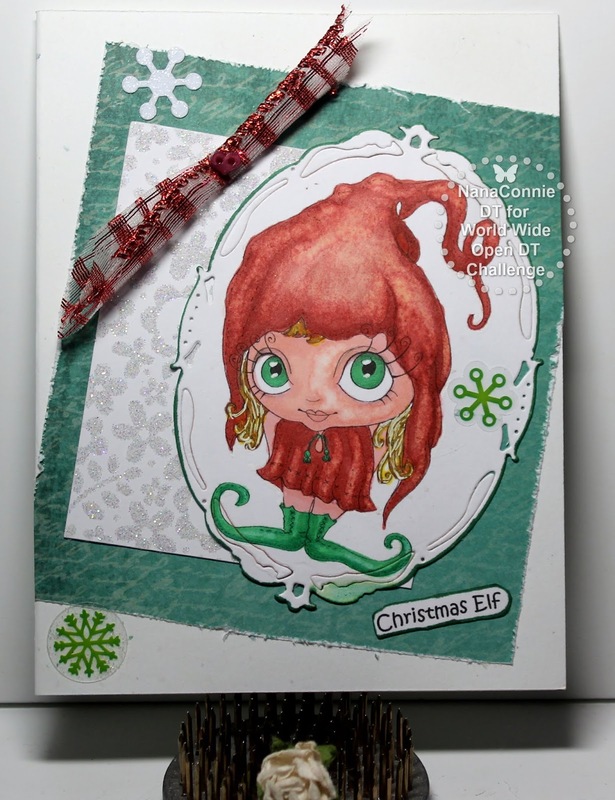 Thanks for linking your Christmas elf card up to the Tic Tac Toe Challenge over on The House that Stamps Built! 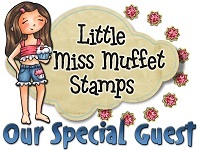 Very cute card!Thank you for sharing with us at the Crafty Gals Corner!Hope you join us again soon!